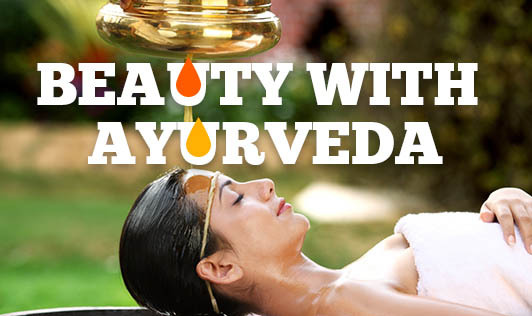 Ayurveda has presented before humankind, a set of effective cosmetics and beauty care directions. According to Ayurveda, all the activities of the mind and body are governed by three psycho physiological energies known as Vata, Pitta and Kapha. When these three principles within us are in perfect balance, we enjoy good health. Blemishes, eruptions, patches and sallow skin are often related to inappropriate diet or lifestyle choices that lead to accumulation of dietary toxins, called ama in Ayurveda. Following a well balanced diet, making sure your digestion-absorption-elimination cycle is efficient and using skin-friendly herbs help your skin look clear, radiant, healthy and youthful. In general, opt for foods that are appropriate for your constitution and the season. Eat lighter meals, space out your timing of meals so that one meal is digested before you introduce another into your system, and choose whole fresh foods. One can find a holistic approach towards life, which is solidly based on the principles of Ayurveda. ?There is a variety of herbs, flowers, leaves, etc for beauty care purposes. Turmeric - is made into a fine paste and applied on the face for glowing skin and to naturally avoid facial hair. Neem - is known as the best naturally available detoxifier and anti-parasitic, among many others. Neem oil is used by Ayurvedics to cure skin disorders like redness and itching, scars and pigmentation, fungal or parasitic infection. Hibiscus - the lovely red flower and the leaves of its plants, when crushed and mixed with water becomes a great natural shampoo, thoroughly cleaning the hair and scalp. It can also be boiled in coconut oil and strained to make a good hair oil. Aloe vera - Many cosmetic products around the world use this wonder herb as a base. Aloe Vera has been trusted for centuries to alleviate skin conditions of all kinds and restore a radiant glow to your entire body. Kayyonni - is a small herb used in the preparation of a hair oil product using coconut oil. It is believed to offer darkness and thickness to hair. The herb is said to have protective features against dandruff and pre-mature hair graying. It is also believed to offer darkness and thickness to hair. ?Ayurvedic beauty care is not just about using some herbs, preparations or oils, but also the entire lifestyle, which must revolve around dinacharya (healthy daily routines) and rithucharya (lifestyle routines right for the season). It is applicable to everyone and you need to stick to certain healthy routines like waking up before sunrise, eating nutritious food, exercising for at least 30 minutes everyday and getting a good amount of sleep.